I've written that I started this project because the Bible has always seemed boring to me. However, that's not entirely true. When I was younger there were a couple things in the Bible that, although boring to most, really intrigued me—the maps at the back and the genealogies of Jesus in Matthew and Luke. 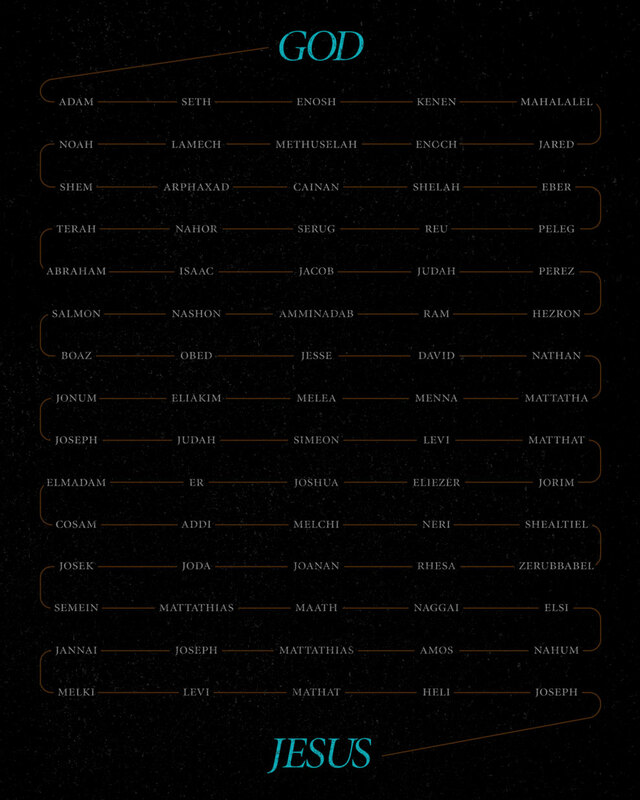 There was always something cool about those genealogies. They seemed like much more than just a list of dads. Through his genealogy, Luke covers the entire human history up to that point, presents Jesus as having divine ancestry but also reveals him to be just another dude with a dad. All in a single chapter. That is some impressive communication. How about you? Are there "boring-to-most-people" parts of the Bible that you really like? Thanks to all the folks who entered to win a free Word print last week. After collecting all the entries, I'm sorry to say that most of you are losers (but just in this contest, not in life). I'll be notifying the 3 winners shortly and they'll each receive a free 16x20 Word print. If you missed out on that freebie and want to make sure you catch the next giveaway, make sure to follow me on Twitter or my Facebook page. Those are the spots I'll most frequently update when there are giveaways or sales.